Let's face it, poker is a game of betting. True, it's also a game of cards and a game of people. But, when we strip it down to the basics, it's all about betting. We want to bet the perfect amount, when we have the best of it and fold when things are not in our favour. How do we know when we should be betting? A common answer is that we should “bet when we think we have the best hand”. That's partly true, but only tells a small part of the overall story. Understanding in more detail our reasons for betting will help us to make better decisions consistently. Let's consider one of the main reasons for betting – value betting. Value-betting is easily the most important reason to bet. A “value-bet” is where we bet with a made hand expecting to get calls from worse hands. A lot of our poker profits is generated this way, especially at the lower limit games. Should we bet the river in this spot? It's true that we haven't mentioned a whole range of important features here such as stack size, pot size, the poker betting action or the type of opponent we are facing. These are all really important pieces of information when making a value-betting decision. But, hopefully, you intuitively realise that we should likely be betting here. We have top-set, a relative monster, and can get called by plenty of worse hands. In most cases, not betting here would be a mistake, we'd be “missing value”. But hold on one second....isn't it possible our opponent could have a straight here? We might value bet our top-set and lose a giant stack of chips against a rather smug opponent holding the straight. So should we check then and play it safe? What do you think? In order to value bet, we must win over 50% of the time when our opponent calls. We should be able to draw two important conclusions from this rule. We don't have to always have the best poker hand when called. According to the rule, even if we only have the best hand 51% of the time when called, it is correct for us to value-bet. We don't have to always bet in situations where we have the best hand. We might find our bottom pair is good on the river 60% of the time in a certain situation. However, if we bet, we might only win 10% of the time when called. We should check. 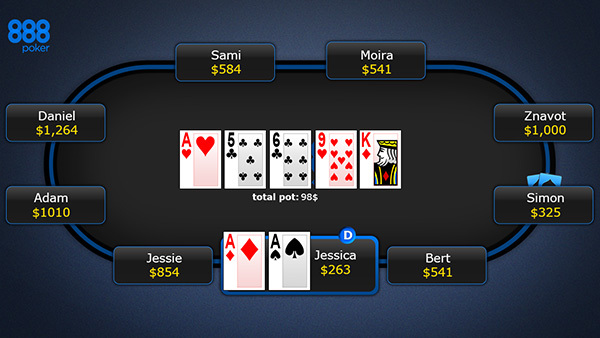 Value betting will be a losing play even if 10% of the time our opponent shows us a worse hand and we rake the pot. What types of hands does our opponent have? What types of hands will our opponent call with, if we bet? We will usually be able to figure out the first part by thinking carefully about the various actions they have taken, during a hand. We might find that certain holdings are very unlikely because they would have folded on earlier streets or taken a different line. We will rarely be able to figure out exactly which two cards our opponent is holding, but using deduction we should be able to put them on a range of possible holdings. This is an important skill for poker players and will greatly influence the success of our betting decisions. Naturally, this kind of process takes practice and we will need to allow ourselves time to think. If we find ourselves constantly making very quick betting decisions at the table, there is a decent chance we will not be getting the best of it. Poker is in many respects more similar to chess than it is to other casino games. It's a game of deep strategy and the best decisions require calculated thought. So don't be afraid to use your time-bank! Understanding our opponents will help us to figure out which worse hands they will call with when we value bet. Even when we are not involved in a hand, we should be paying attention to the action. We can use this information to help us make better decisions in the future. We are interested in what type of opponent we are facing. Are they very tight or very loose? Are they aggressive or passive? For the most part, the tighter our opponent, the harder it is to successfully value bet against them (although, they might make great targets for bluffs). They will continue with stronger hands, in general, which makes it less likely we win the required 50% of the time when called. At the opposite end of the spectrum, there are players that don't really even know what a fold button is, let alone where to find it. Against these opponents, we can usually value bet very often, even with some weaker holdings. The important thing to understand is that the more we know about our opponents, the better the decisions we are able to make. And the only way to get good information regarding our opponents is to watch them carefully, looking for patterns and tendencies. It's important to remember that we are simply scratching the surface here. We have looked at value-betting as one of the main reasons for betting, but it's necessary to also consider other reasons for betting such as bluffing and betting for protection. It's also necessary to establish the best bet-sizing in any given situation. This is a huge topic and even seasoned professionals spend much of their time studying and improving this particular aspect of their game. Poker is a big game and we can't learn everything at once. Even if we could, it's better to improve our game one step at a time rather than attempting to cram our brains with a truckload of conflicting information. So the next time you are at the tables, think deeply about what type of hands your opponent has, which hands he may call a bet with, and whether it's possible to eke out a little extra value with some of our made hands.